Hurtling through space at what seems like lightspeed, your goal in Stay Alive ($.99) is exactly that — you must stay alive as you navigate through asteroids and fend off enemies, all while collecting orbs to upgrade your ship. It becomes a vicious cycle, collecting orbs to upgrade your ship just so you can collect more orbs — but you'll find this addicting game is the best of its kind. Your reflexes will be tested as you blast through space in the newest title from Drummer Games. There are 21 levels to play, but the real challenge comes in "endless mode". In this mode of gameplay your only objective is to fly as far as you can without dying while trying to beat your previous best distance. Each time you play the endless mode the level is randomly generated, presenting a new challenge at all times. Stay Alive has a simple but very appealing art style, but what stands out most to me in this game is the wonderful 8bit music. As you fly through deep space it's very important to have an enjoyable soundtrack, and the music in Stay Alive is exactly that. If you're looking for a game to keep you on your toes, this is a perfect choice. 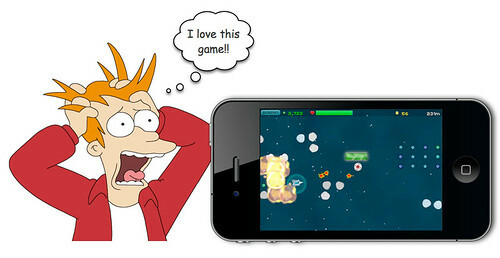 Your reflexes will be pushed to the limit as you shoot bad guys and dodge flying space rocks. For the competitive, the endless mode will have you glued to your phone trying to beat your own high score as you seek to scale up the leaderboards. Stay Alive is a real steal for just $.99, but if you're still not convinced there's a free version available for nonbelivers to test drive.